There is a thin line between knowledge is power and knowledge breeds fear — Simple.Savvy.Self. When discussing all the concerning ingredients in our food, our makeup and our personal care products, we can quickly become overwhelmed and discouraged. It begins to feel futile to care so we throw our hands up in the air and proclaim, “ I give up! Everything is bad for us, why bother?” Trust me, I’ve been there. I was there several times last month, while researching topics for March's series, "It's What's on the Inside That Counts" and I’m sure I’ll be there again. Fortunately, most times, just as I’m losing my will to “fight the good fight,” I’m encouraged, once again, by the many advocates, companies, and retailers offering healthier, responsible choices and who put the consumer’s well-being ahead of their bottom line. Whether it’s the organic produce at your neighborhood farmers market or the local shop offerings plant-based skincare products, our choices are expanding and the purchasing power is in our hands. That being said, I (we) can not get bogged down with every concerning study I read or the latest grim headlines. There’s a thin line between knowledge is power and knowledge breeds fear. I’ve been told that comparison is the thief of joy and, although I believe that to be true, I also believe fear is a major culprit in the war against joy. We can not be truly joyful when fear is present and we’re focused on the “what ifs” or doing it perfectly. Maybe your world feels like a holistic healthy oasis one day and a dimly lit alley of GMOs and suspect chemicals another. Either way, oasis or alley, you still need to live your life. We can’t always control what we eat on vacation or at a party and sometimes we just want a pedicure, no questions asked. AmIright?! You can; however, make more informed decisions about what you bring into your home on a regular basis. You can vow to learn more about the ingredients in your food and the products you use and decide whether they truly work for you and your family. If not, you can rest assured that you have the freedom and the means to set out to find safer, healthier alternatives, one simple savvy step at a time. 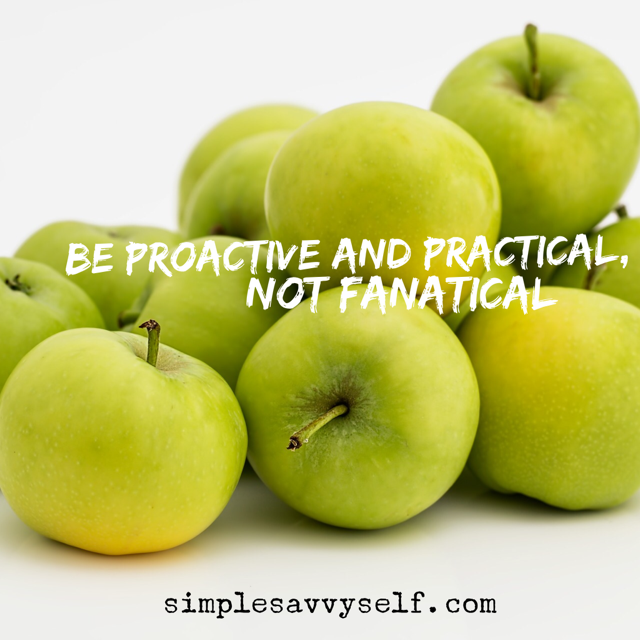 My message with all this is quite simply: Be proactive and practical, not fanatical. Do the best YOU can (please note: every one’s ‘best’ is different), most of the time, and don’t sweat the rest. After all, haven’t you heard?! Too much stress isn’t healthy for you either.